Though it may not be as true today, in the 1980s you could almost always count on a Lucasfilm game (or Epyx game for that matter) to be of high quality. 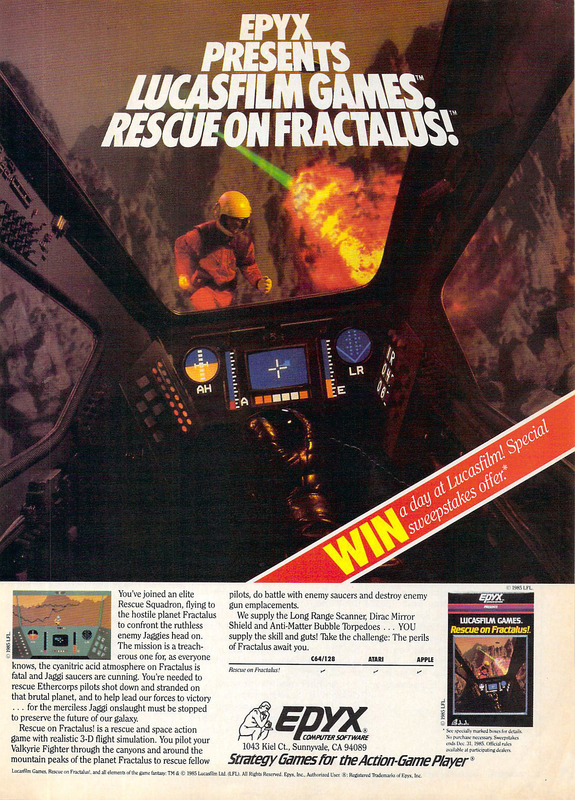 Rescue on Fractalus is no exception. It was initially developed for the Atari 8-bit line of computers (and the Atari 5200 which is essentially the same thing internally anyway) and later ported to other popular computers such as the Commodore 64, Apple II and even the Tandy Color Computer 3 (a rare high profile 3rd party title for that system). It was developed by Lucasfilm Games and distributed by Epyx, Activision or Atari depending on the version and location it was released. 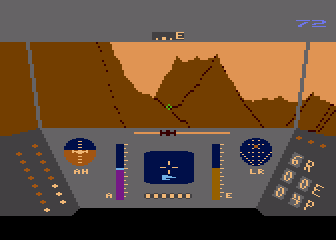 In Rescue on Fractalus, you pilot a spaceship through mountainous terrain looking for downed pilots to rescue. Once found, you must land close enough so that the downed pilot can make it to your ship before dying in the acidic atmosphere. To make matters more difficult, aliens take pot shots at you during you search. In addition, they will sometimes impersonate downed pilots in an attempt to get aboard your ship. One unique aspect of this game is that the terrain is generated using fractals (hence the name). This is definitely a challenging game but one that is well worth playing. Both the Atari 8-bit and Commodore 64 versions are good and are easy enough to find for emulation purposes if you can’t track down an original (or don’t have the equipment). This game would make for a great modern remake but alas there have been none. The most “modern” versions are a slightly expanded Atari XE/XEGS version with more levels and an unfinished Atari 7800 prototype that was discovered in 2004. No two drugs have defined human civilization the way alcohol and caffeine have. Nature created both to kill creatures much smaller than us — plants evolved caffeine to poison insect predators, and yeasts produce ethanol to destroy competing microbes. True to its toxic origins, alcohol kills 3.3 million people each year, bringing about 5.9% of all deaths and 25% of deaths among people aged 20 to 39. Alcohol causes liver disease, many cancers, and other devastating health and social issues. On the other hand, research suggests that alcohol may have helped create civilization itself. Alcohol consumption could have given early homo sapiens a survival edge. Before we could properly purify water or prepare food, the risk of ingesting hazardous microbes was so great that the antiseptic qualities of alcohol made it safer to consume than non-alcoholic alternatives — despite alcohol’s own risks. At first, humans obtained alcohol from wild plants. Palm wine, still popular in parts of Africa and Asia today, may have originated in 16,000 BC. A Chilean alcoholic drink made from wild potatoes may date to 13,000 BC. Researchers now believe the desire for a stable supply of alcohol could have motivated the beginnings of agriculture and non-nomadic civilization. Residue on pottery at an archeological site in Jiahu, China, proves that humanity has drunk rice wine since at least 7,000 BC. Rice was domesticated in 8,000 BC, but the people of Jiahu made the transition to farming later, around the time we know that they drank rice wine. “The domestication of plants [was] driven by the desire to have greater quantities of alcoholic beverages,” claims archeologist Patrick McGovern. It used to be thought that humanity domesticated wheat for bread, and beer was a byproduct. Today, some researchers, like McGovern, think it might be the other way around. Alcohol has been with us since the beginning, but caffeine use is more recent. Chinese consumption of caffeinated tea dates back to at least 3,000 BC. But the discovery of coffee, with its generally far stronger caffeine content, seems to have occurred in 15th century Yemen. Before the Enlightenment, Europeans drank alcohol throughout the day. 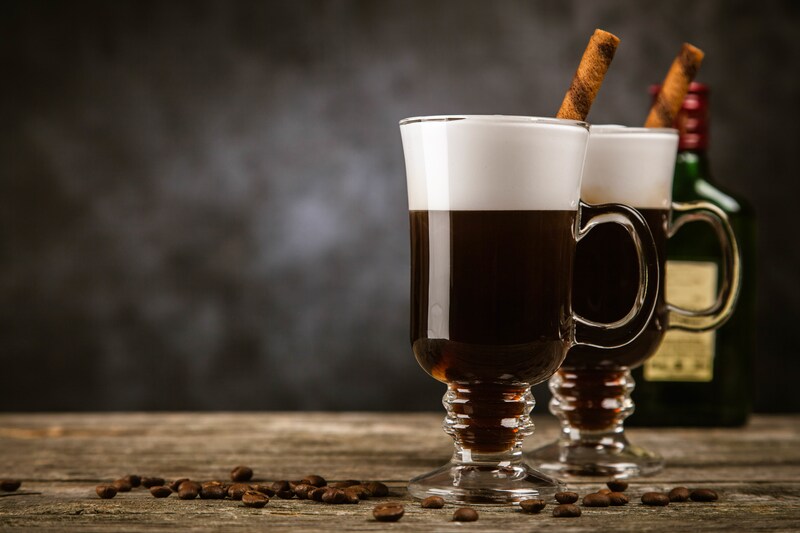 Then, through trade with the Arab world, a transformation occurred: coffee, rich with caffeine, a stimulant, swept across the continent and replaced alcohol, a depressant. Coffeehouses quickly became important social hubs, where patrons debated politics and philosophy. Adam Smith frequented a coffeehouse called Cockspur Street and another called the Turk’s Head, while working on The Wealth of Nations. The Enlightenment and Industrial Revolution saw an explosion of innovation and new ideas. Living standards skyrocketed. New forms of government arose. More recently, globalization took the classical liberal ideal of peaceful exchange to a new scale and reduced worldwide inequality. Today, despite population growth, fewer people live in poverty than ever before. People live longer lives, are better educated, and many more enjoy the blessings of liberal democracy than was the case decades ago. Caffeine is the most widely consumed psychoactive drug worldwide. Alcohol gave civilization its start, and it certainly helped the species drown its sorrows during the grinding poverty of much of human history. But it was caffeine that gave us the Enlightenment and helped us achieve prosperity. Read the rest at USA Today. Chelsea Follet works at the Cato Institute as a Researcher and Managing Editor of HumanProgress.org.